The ANSWER Coalition, along with other organizations, is actively mobilizing to build public support to defend Private Bradley Manning, Wikileaks and all those who are being targeted for severe repression for revealing (or allegedly revealing) “secrets” that expose war crimes committed in Iraq and Afghanistan. 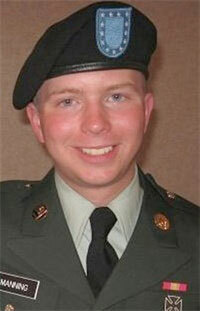 Bradley Manning is a 22-year-old soldier who was stationed in Iraq. He was arrested and has been held incommunicado for months. He is charged with releasing a graphic video of an attack in April 2007 by a U.S. Apache helicopter that killed a group of journalists and civilians. The Pentagon had refused to release the video of the attack, which had been requested in a Freedom of Information Act request by Reuters news service. Two Reuters employees were killed, numerous civilians were massacred and two children were severely wounded in the attack. The video became a major scandal when it was released by WikiLeaks. Manning is now imprisoned at the Marine Base in Quantico, Va.
We urge everyone who can to join events demanding Free Bradley Manning taking place across the United States and around the world between September 16 and 19. There will be a rally at the Quantico Marine Corps Base where Bradley Manning is being held. It will take place on Sunday, September 19 at 11:30 am in the Town of Quantico Municipal Park (River Road and 4th Avenue). Events will also take place in California, Connecticut, Massachusetts, Minnesota, New Hampshire, New York, Oklahoma, Oregon, Tennessee, Virginia, Washington State and elsewhere. Click here to see a list of events taking place across the United States and internationally. If you can't personally come to an event, you can help and show your support by sending an urgently needed donation to help the anti-war movement organize activities in defense of those heroes inside and outside of the military who dare to tell the truth. Click here to send a donation today.